There is so much to plan for as you prepare for your upcoming trip to the Great Smoky Mountain. Let us take the pressure off! Below are a handful of frequently asked questions that should help. If you still haven't found the answer you are looking for please contact our office today for additional assistance. Pets are permitted only with prior approval and only in selected cabins. An additional pet rental and additional Damage Deposit on your credit card will apply. Pets brought without advance notice will be charged DOUBLE the normal pet fees. Pets brought to cabins that do NOT allow pets can result in immediate eviction with forfeiture of remaining paid stay. Pets are not allowed on furniture (including beds and sofas), at any time. Unattended pets in cabin must be crated caged. Evidence of any pet being in the hot tub will be cause for loss of security deposit in full and may be subject to additional fees. What are the check in check out times? Check in is after 3:00 PM and Check Out is before 10:00 AM. NO early Check Ins or Check Outs. We need the in-between time to prepare for our next guests. How much do I have to pay when I book a rental online? A 50% deposit by credit card is required to confirm a reservation. The balance of the rent and tax is due at least 30 days prior to the stay. We don’t charge a booking fee. The deposit is refundable (less a $75 charge) only with written cancellation at least 30 days prior to arrival date. Without 30 days notice, deposits are only refundable if the cabin is re-rented. No shows and early departures are obligated for the entire amount of the reservation. We recommend that you bring or purchase consumable supplies (paper towels, toilet papers, trash bags, soap, laundry detergent, and toiletries). There will be a “starter amount” of these when you arrive, but it is not meant to last your stay. If there is a charcoal grill, wood-burning fireplace or fire pit, you will need to supply the fuel. We supply dishwasher detergent, hand soap, and dishwashing fluid. If you will be enjoying a water activity like tubing or white water rafting, we recommend bringing beach towels. What is considered a week? We consider a week 7 nights and the 7th night is automatically free -- it's six times the nightly rate for seven nights. You may begin your week any available night: it does not have to be Sunday to Sunday or Saturday to Saturday. If you stay for less than seven nights, you will receive the nightly rate. If you stay for over a week, any additional nights will be at the nightly rate as well. 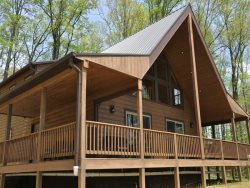 Do all cabins have phone service and internet access? Not all cabins have landlines and/or cell service available. Some properties have internet access. Please be sure to check the advertisements -- if you are unsure, please contact us. If the cabin has internet access, please note that it is limited in the mountains: speeds are typically slower than other areas and sufficient for light use only. Internet access is available in select properties for light surfing – for example, checking emails, browsing the internet for things to do in the area, participating in social networking, and online shipping. Mountain internet access is not suitable for heavy usage such as downloading large files, remote desktop connections, and streaming video through services such as Netflix, or Amazon Video. Heavy usage is prohibited.